Robert Baden-Powell (B-P) returned from Africa in 1903 as a national hero of the Boer war. His military training manual “Aids to Scouting” quickly becomes a best-seller being used by teachers and youth organisations. In August 1907 B-P held an experimental camp on Brownsea Island in Poole Harbour for twenty-two boys of mixed social background to test out the applicability of his ideas. His next manual “Scouting for Boys” is published in six instalments in 1908. Boys and girls start spontaneously forming Scout troops, first nationally and soon internationally. A rally for all Scouts was held at Crystal Palace in London in 1909 at which Baden-Powell discovered a Patrol, who claimed to be Girl Scouts. B-P was in favour of girls becoming scouts but Edwardian society considered it inappropriate for young ladies should be out-and-about, camping, hiking. The Girl Guide Movement was formally founded in 1910 by Baden-Powell's sister, Agnes Baden-Powell and then with the help of his wife, Olave. B-P had envisaged Scouting as a movement for boys between the ages of 11 and 18 but Scoutmasters soon faced the problem of younger brothers wanting to join. Some turned a blind eye to the age of some of the boys while others formed Patrols and Troops of Junior or Cadet Scouts. In 1914 B-P outlined a scheme in The Headquarters Gazette for the training of these Junior Scouts which within two years became renamed Wolf Cubs based around the “Jungle Books” of B-P’s close friend Rudyard Kipling. Cubs had their own distinct uniform, badges, motto, sign and salute. In 1917, B-P set up a scheme for Senior Scouts, which changed its name to Rover Scouts (in 1918) for anyone over the age of 18, with Outdoor Adventure and Service as the mainstays of its programme. In 1920, the 1st World Scout Jamboree took place in Olympia, and Baden-Powell was acclaimed Chief Scout of the World. The World Organization of the Scout Movement (WOSM) was also established in 1920 with its headquarters in Geneva, Switzerland. WOSM's mission was to contribute to the education of young people, through a value system based on the Scout Promise and Scout Law, to help build a better world where people are self-fulfilled as individuals and play a constructive role in society. 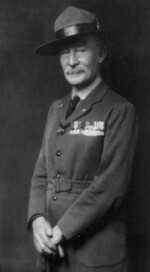 Baden-Powell was created a Baronet in the 1921 New Year Honours and Baron Baden-Powell, of Gilwell on 17 September 1929. By 1922 there were more than a million Scouts in 32 countries, by 1939 the number of Scouts was in excess of 3.3 million. First, the Association's name changed to become the “Scout Association”. The Cub section dropped the Wolf to become “Cub Scouts”; the Scout section also dropped the Boy, and the upper age limit was altered to 16; Senior Scouts and Rover Scouts were disbanded, to be replaced by “Venture Scouts” for the 16 to 20 year olds. Secondly, the B-P Guild was set up for those members who wanted to participate in Scouting over the age of 20, but did not want to necessarily commit themselves to a leadership role. This was later replaced by the “Scout Fellowship”, a branch of the International Fellowship of Scouts and Guides (IFSG). Thirdly, the Scout and Scouter Uniforms changed; out went the lemon squeezer hats and the shorts, and in came green berets, mushroom trousers, and green shirts for the Scouts, and fawn shirts for the Venture Scouts and Leaders. Finally, the training schemes changed; gone were the first and second stars, in came the Arrows; out went first class and second class, in came the Scout Standard, Advanced Scout Standard and Chief Scout Award. The Bronze, Silver and Gold arrows lasted just eleven years before a new developed arrow scheme was introduced, which allowed Cubs virtually complete freedom to choose which twelve activities they took part in for each of the three arrows. This was again superceded in 1990 by a new award scheme consisting of the Cub Scout Award, Adventure Award and Adventure Crest Award. Girls were first allowed to join Venture Units in 1976. Individual Scouting sections were given the option to allow girls to join in the late 1980’s. At the moment approximately 5-10% of Groups in the Country are mixed. The Scout Standard and Advanced Scout Standard disappearing in 1983, to be replaced by the Scout Award, Pathfinder Award, and Explorer Award. These also introduced more choice for the Scout, and yet again modernised the programme. Only minor changes to the scheme have been made since 1983, most noticeably to put traditional Scouting skills back into the core of the programme. In the early 1980's Scout Groups were allowed to take in boys in the 6-8 age range to Beavers although at this point the Beavers were not part of the Scout Association until April 1986. There are 155 countries with internationally recognised National Scout Organisations. There are more than 28 million Scouts, youth and adults, boys and girls in 216 countries and territories.